The identification of Conservation Focal Areas is one of two main components of New Jersey's revision of the State Wildlife Action Plan that aims to identify and address the highest priority NJ fish and wildlife resources. The existing plan's focus will be narrowed by establishing and prioritizing focal species, identifying the areas that provide good conservation opportunities and then target the greatest threats to those species and habitats. Implementable conservation actions will then be linked to those threats, creating a blueprint for conservation of NJ's wildlife. 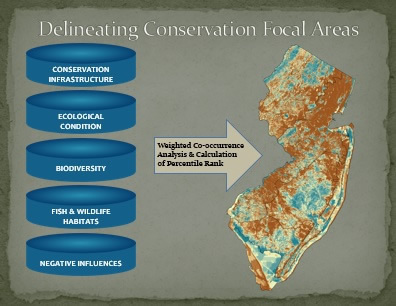 Conservation Focal Areas represent the second of a two-part approach to identifying threats to New Jersey's Species of Greatest Conservation Need (pdf, 720kb) (SGCN), as well as to develop actions which will address these threats. In addition to identifying "Focal Species" (a priority subset of SGCN), specific geographic areas (pdf, 92kb) of NJ's landscape are recognized as presenting greater opportunities for effective conservation action. Conservation Focal Areas are where the conservation community can undertake actions to improve the conditions not only of the focal species but of a wider set of species relying on the same habitats. Incorporate a regional perspective/context that addresses ecosystems of importance to the Northeast Region that are found in New Jersey. Emphasize riparian corridors that serve to connect larger tracts of habitat in an otherwise fragmented landscape. Identify the threats in each Conservation Focal Area and develop conservation actions that will guide the conservation community and land-use decision makers that are able to undertake actions to improve the conditions of New Jersey's highest priority fish and wildlife resources. Back to Wildlife Action Plan (WAP). Please use the form below to submit comment on Delineating Conservation Focal Areas only; there are separate comment forms for each aspect of the Plan. Make sure to complete fields that are designated as "* = required". Thank you for reviewing the NJ Wildlife Action Plan and submitting your comments.